Great...Great.... KB ji, Thanks for posting WNSO news Published on Kantipur Saptahik. wowow.. great kb bro.. WNSO ko ali badhi publicity garchu parchha.. euta WNSO awarness campaign chalaune ho ki? Wow, another great NEWS about WNSO and it will surely help WNSO to expand, to reach to the thousands Nepalese students inside nepal, and outside nepal too. Thanks KB Ji for posting the news from my side too. Absolutely great news for the WNSO team and members.The contribution and hard dedication of all members to this organization is giving a great worth now.It can be seen from all those magazine and other medias who are writing about wnso.But ,the missions haven't accomplished yet.There is lot more things to do...let's make wnso the top organization of the world who actually do what it means to.. It's great news to all of us. Cheers!! Congratulations! It is our privilege to notify you that http://www.wnso.org/ has been selected as one of the “Best 51 Websites” listed on http://www.nepalnet.net/best/ . Your website was selected among nearly thousand websites submitted and reviewed for the award by team of online editors. During the selection process, we judged a website based on what and how well it presented information related to Nepal to the internet. The complete list of the websites who won in your category can be found at http://www.nepalnet.net . We have decided to make changes to how the Best 51 Websites is awarded. We are asking the current winners of the award to vote for the next "Best 51 Websites." The average votes from the current winners will be given half weight while awarding the "Best 51 Websites." Your group will be ineligible to vote for any website in which any member of your group has been involved. Please contact me if you are willing to participate. Congratulations again on your achievements to date and best wishes for even more success in the future! CLOTHES DISTRIBUTION & BLOOD DONATION Program news published on The himalayan Times. 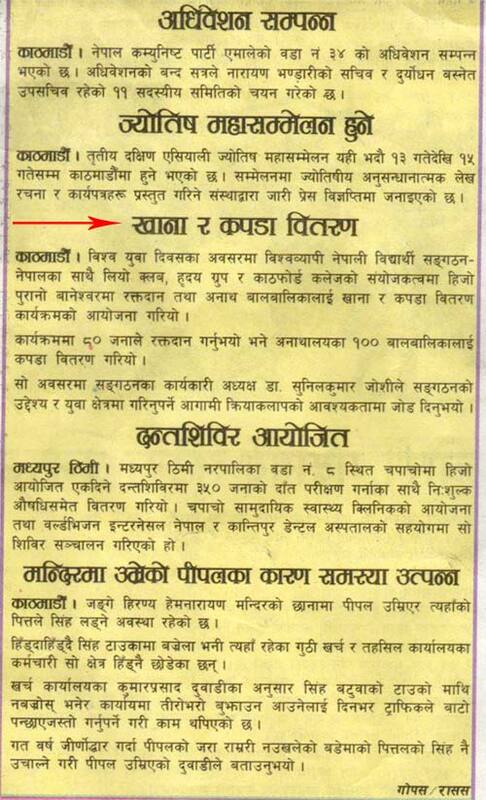 CLOTHES DISTRIBUTION & BLOOD DONATION Program news published on Gorkhapatra. We would like to say great thanks to All press and Media who published the news of WNSO-Nepal's Program. Edited by kbroka, 15 August 2006 - 04:12 AM. Good to know that we started to move again.